Showing 18 articles from July 2, 2013. 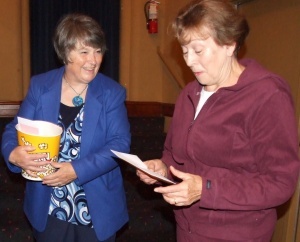 Sherry (right), a guest at the June 27 dedication of Raymond Theatre’s new digital projector, accepts one of 34 gift certificates handed out that evening by Jewel Hardy. SOUTH BEND – Though it may be moving along at a seemingly snail’s pace, the economy in north Pacific County is slightly picking up. The past few months has shown steady progress in the local logging industry, which is an indication that the housing market is starting to improve as well. ABERDEEN – Harbor Battery Company in Aberdeen has been a well-respected business in Grays Harbor since 1941. Henry Sherman Sr., Cindy Sherman and Henry Sherman Jr own the company. The State Legislature came to an agreement on a $33.5 billion budget deal Thursday that avoided a state shutdown. Monday was the first day of the new budget cycle. The budget avoids any new major tax increases. There are many provisions with sizeable investments for education. Legislatures will next turn their attention to passing a capital budget and a transportation plan. Senator Brian Hatfield (D-Raymond) released a statement Friday on the passage of the 2013-15 biennial budget. Fireworks usually mean head to the beach in this neck of the woods – and there’s plenty of sandy beaches that will be have its skies lit up on America’s Birthday! The most popular war zones are Long Beach, Ocean Shores, Westport/Grayland, and Ocean Park. Photo by Sally This cute little deer was a little camera shy while looking for berries at a yard in South Bend. The community of Ryderwood will be celebrating its 90thbirthday Thursday and many events are scheduled to take place. At 10:30 a.m., there will be a parade, with the lineup beginning on Second St.
Then at noon at the park, and lasting into the evening, will be a BBQ fundraiser organized by members of the VFW, as well as a picnic potluck and a “Pie Walk” and games after the picnic. Live entertainment will also be at the gazebo. Oops! Cheese Days contact is Ron Smith, (360) 864-4391. Visit www.toledolionsclub.org for details. Dale was last year's contact. Toledo School Board will host a Budget Workshop 6 p.m. Tuesday at district office. Public invited. Contact (360) 864-6325. Well, now that all the chaos surround Egg Day is over and done with, this upcoming week promises to be very slow. I plan on enjoying the short respite by installing a new fence and cleaning up my yard a bit. Yes, I live life on the wild side. In fact, with Independence Day coming up, even less will be going on than ever. The Farmer’s Market has been cancelled for Wednesday and will resume its regular schedule of Wednesdays from 9 a.m. to 3 p.m. the following week. Please contact Jeanie at (360) 785-4817 for more details. Cathryn Jane McKnight, 88, long time resident of Lewis County passed away Monday, April 15, 2013. She was born October 1, 1924 in Bengough, Saskatchewan, Canada to W. Elmer and Lois (Ferguson) Lyvere. Cathryn was preceded in death by her husband, one brother, Lloyd Lyvere and three sisters: Bernice Wilkinson, Lucille McDowell and Wilma Lincoln, son-in-law Bud Dailey and granddaughter Ashley Nelson. 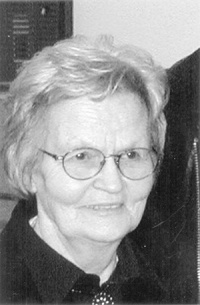 Charlotte E. Kelley, of Toledo, died June 23, 2013. Born Jan. 17, 1922, she was 91 years old. She was preceded in death by three brothers, three sisters, one son and one step-daughter. She is survived by nine daughters, four sons, one brother, one sister, 40 grandchildren, several great-grandchildren and several great-great-grandchildren. Kathleen Campbell Aldridge, of Cordova, Ala., died June 27, 2013. Born Sept 24, 1929, she was 83 years old. She was preceded in death by father Scott Campbell, mother Myrtle Barton, brother Charles Campbell, and sister Rachel Prevatt. The City of Castle Rock is hoping to make use of a potential opportunity for millions of dollars in state road funds, which could help ongoing efforts to reconstruct Front Ave. Discussed during the June 24 Castle Rock City Council meeting, Public Works Director Dave Vorse said the city may be able to apply for additional funding from the Surface Transportation Program (STP) if other municipalities are lax in using the STP funds they have been allocated. 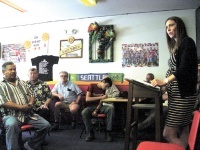 Federal Representative Jaime Herrera Beutler (R, Wash.) is taking time between legislative sessions to meet with her constituents within Southwest Washington and began her tour Monday with a coffee shop meeting at Winlock’s Guadalajara restaurant. Greeted by a crowd of a few dozen residents from all across the area, she got right to the point of asking what important issues were on the minds of those in attendance. Sally Vogel requested and received funds for the 13th Annual Winlock Pickers Fest, taking place July 12-14 at Winolequa Park, during the June 24 Winlock City Council meeting. However, last Monday's City Council meeting was largely a retrospective analysis of actions undertaken within the past two months to identify new leaks in the city’s water supply system. Large breaks leading to significant water losses had been identified during the previous meeting by Sewer/Water Superintendent Dennis Baker, who asked the council where funding was going to come from for the repairs, as his current budget is struggling. The Winlock High School Boy's basketball team spent this last week at the University of Oregon Team Basketball Camp in Eugene. Those that attended included (front row, left to right) Assistant Coach Tony Quazada, Zack Weinert, Jared Pohll, Jose Keim, Logan Hotnot, Skylar Tremayne, Head Coach Dennis Tauscher, (back row, left to right) Wyatt Dean, Caleb Rose, Deven Miller, Chance Fisher, Josh Foster, and Evan Mitchell. 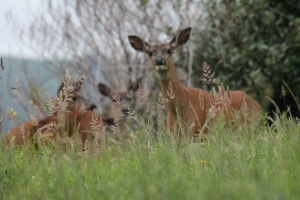 A California man escaped with relatively slight injuries after his motorcycle collided with a deer Thursday, according to the Washington State Patrol. The 55-year-old San Francisco resident had been traveling northbound on SR 505 near milepost 16, southeast of Toledo, when his 2012 BMW R1200GS collided with a deer that had wandered into the roadway. When I sat down to watch Despicable Me 2, by Illumination Entertainment, I was amped up for more of the slapstick action and super villain humor that made its predecessor a gem, and I was not disappointed. While deviating reasonably far from the plot and theme of the first movie, this makes a miniscule difference as the level of charm, wit and minion antics did not change a bit.